During a press conference Monday night investigators said they had secured an arrest warrant for Akein Scott, 19, and pleaded with the public to help bring the alleged shooter to justice. City law enforcement officials publicized a mug shot of the young man, who they say was released from jail on a bond on April 29, according to WWL-TV in New Orleans. 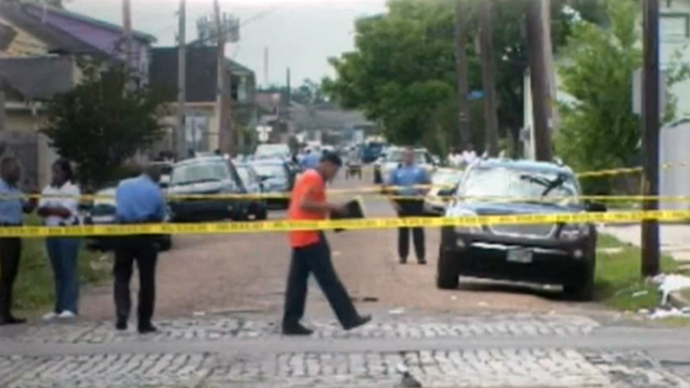 Police also advised that a New Orleans SWAT team will patrol the streets until Scott is found. They urged him to turn himself in multiple times, and admitted they’re still investigating whether he acted alone. Three search warrants were executed to no avail in the hours before the press conference. “The important thing for Akein Scott now is to turn himself in,” said Police Superintendent Ronal Serpas. He added that multiple tips have identified Scott as the perpetrator who opened fire on a crowd and injured 19 people during a Mother’s Day parade. Most of the victims have since been released from the hospital. Police have also offered a $10,000 reward and posted blurry surveillance camera images earlier in the day Monday. “The people chose to be on the side of the young innocent children shot instead of on the side of a coward who shot into the crowd,” Sepas said. 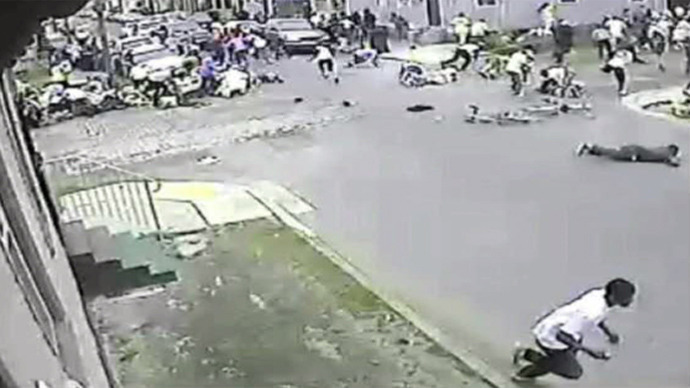 Gunfire erupted in the Seventh Ward neighborhood at around 2:00pm local time (1900 GMT) during an annual Mother’s Day parade attended by up to 400 people. Based on a preliminary investigation, the FBI confirmed that the shooting was likely related to street violence, not terrorism. Cellphone video obtained by police and released in the aftermath shows the parade crowd suddenly scattering, and some falling to the ground, in front of a man wearing a white T-shirt and dark pants. He is seen running away from the crowd while shooting at people. Scott was previously arrested for illegal possession of a stolen firearm, illegal carrying of a weapon, resisting an officer, contraband to jail, illegal carrying of a weapon while in possession of a controlled dangerous substance and possession of heroin, according to a police statement as quoted by CBS News. Sepas praised law enforcement’s handling of the case so far and told reporters three gunshot victims are still in critical condition but are expected to survive. He would not speculate as to whether Scott was the only person to fire a weapon at the parade Sunday. In a Monday afternoon press conference, police said they were making headway in the investigation. Police and local media had called for anyone who recognizes or may know the possible suspect to contact crime stoppers in the hope of tracing the gunman, or gunmen. Up to three gunmen are believed to be at large. "There were hundreds of people there, and somebody saw something," New Orleans Mayor Mitch Landrieu said in a public appeal. A $2,500 cash reward was initially offered, which was later raised to $10,000 amid a massive manhunt. The reward is being offered to anyone who can provide information that leads to an arrest. The shooting victims – 10 men, seven women, a boy and a girl, both 10 years old – were taken to hospitals for non-life-threatening wounds; three remain in critical condition.